When you’re looking for a job, you want to put your best foot forward. You and a hundred other applicants. A common lie many applicants hear. Sometimes, a recruiter will look at an applicant and think that they would be a poor fit due to their skills, personality, or whatever reason. But instead of saying that, recruiters take the easy way out and say that they want to go in another direction. They just don’t want to hurt feelings and burn bridges, which is understandable. It’s also easier to say this than explain the decision making process between hiring two applicants with near-identical resumes. Yes, they will keep your resume, but not for the reason you expect. They’ll keep it on file for record-keeping purposes but they won’t read it when another position comes up. There just isn’t enough time for that. It sounds weird, but it’s easier to post a new job opening to new applicants than to dig up archives and guess whether an old applicant is still looking or already employed. If you’re truly interested in working for the company, reapply for the position should it come up later. That’s the only way to keep your resume top of mind – and on the top of the recruiter’s pile. “Excellent employee benefits” and, “great workplace culture” are subjective. Do your own research to make sure what they have to offer is in alignment with your definition of “excellent” and “great.” Companies know that benefits are important to candidates, and have to deal with the balance of paying what is fair versus what stockholders demand for a profitable company. Keep in mind that sometimes the workplace culture and extra perks will compensate for the lower pay, but that either way your view of excellent and great may not match theirs. When was the last time YOU discriminated against someone because they were just too good? Someone was so great and so qualified that you couldn’t possibly want them working for you. What’s more likely is that they’re afraid you would demand a higher level of pay than they had budgeted, or that there was something about you and the company that didn’t jive in the interview. Sometimes, the fit is just not right, and that is a more honest answer. How many times have you heard this one, and then never heard back from the company again – or simply received a letter in the mail thanking you for your time and saying that they’ve gone in another direction? This happens for several reasons. Sometimes, they don’t want to let you down, or they haven’t made up their minds, or have gone with someone else. Sometimes, they know right away that you’re not the one, but want to keep their options open (and you on the hook) until they can check with their top candidate. The job search is tough! 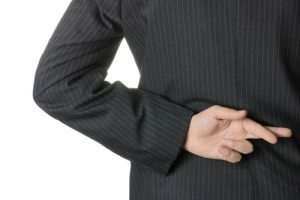 The white lies are usually intended as a gentler, “no” than kicking you to the curb. Keep your head up and search on. You’ll find the perfect match.